Here's the 14th sale this month as John Cohen at Merle Wood & Associates confirms that he's closed on the sale of Feadship's 52.12m motor yacht Battered Bull working with Merle Wood in an in-house deal. Built in 1995 by the Van Lent yard to Lloyd's class, her lines are from the De Voogt Naval Architects studio. 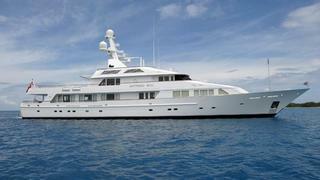 Designed and built for an experienced yachting family, Battered Bull has had only private use and never chartered. Conceived with worldwide cruising as a top priority, she has effortlessly logged more than 250,000 nautical miles to date to some of the most remote cruising grounds. With extremely flexible accommodation for 14 guests in seven staterooms plus crew quarters for up to 14, she is ideally suited for both charter and private use anywhere in the world. Battered Bull was asking $19.9 million.